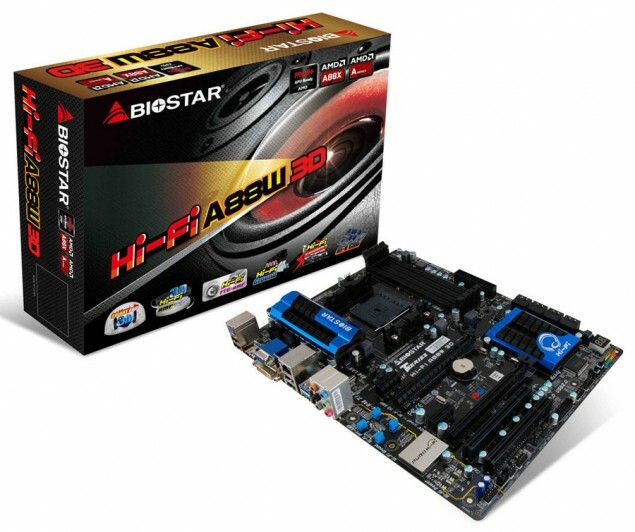 Biostar has announced their latest Hi-Fi A88W 3D motherboard featuring the A88X chipset and FM2+ socket to support Kaveri APUs. AMD would launch their Kaveri APU with the new Steamroller cores and integrated GCN graphics later this year. The Biostar Hi-Fi A88W 3D motherboard comes with a 6 Phase VRM equipped with high quality components, a moisture proof PCB design and Low RdsOn P-Pak MOS is a low resistance design that can significantly reduce the current in energy loss. The motherboard is supplied power through a single 4-Pin connector and a 24-PIN ATX connector and has four DIMM slots supporting 64 GB of memory capacity with rated frequencies of upto DDR3-2600 MHz (O.C+). The FM2+ socket would allow support for both the current generation Richland, Trinity APUs and also the next generation Kaveri APUs which arrive in Q4 2013. As for expansion slots, the motherboard offers two PCI-e 3.0 x16, two PCI-e 3.0 x1 and two legacy PCI slots. The motherboard fully supports AMD Dual graphics functionality. For storage, the motherboard offers 8 SATA 6Gbps ports. The motherboard has a nice layout and comes with a black and blue color theme with two sets of heatsinks on the PCH and power phases. Sound is powered by Biostar’s Puro Hi-Fi technology which includes Hi-Fi 3D AMP featuring the new generation 3D Ampligier driving the high-end headphones with over 100 dB loads and 600 ohm impedance while the Hi-Fi Pre AMP tech allows the built in amplifier to boost the speaker volume with HD audio. I/O options include 4 USB 3.0, 10 USB 2.0, 6-Channel audio jacj, Gigabit Ethernet LAN, VGA, DVI, HDMI and a PS/2 connector. Various features of the board are listed below while the product page can be found here. Audio+ Features – The audio features from BIOSTAR are extensive. As we’ve been working on high end audio components, the Hi-Fi A88W 3D continues this tradition with audio features like “3D Audio”, “True Blu-Ray Audio”, “3D Hi-Fi Amp” and “Smart Ear 3D”. Video+ Features – With AMD’s Radeon Graphics and support of Microsoft’s DirectX 11.1, the Hi-Fi A88W 3D delivers 3D powered graphics with ease. There is support for full HDMI 3D 1080P and a Dual-Link DVI port for resolutions up to 2560×1600. AMD Eyefinity technology also supports multiple monitors as well. Speed+ Features – The Hi-Fi A88W 3D supports PCI-E 3.0 technology. This is 2 times the bandwidth of PCI-E 2.0 and allows for up to 1 GB/s of bandwidth per lane per direction. The Smart SpeedLAN, which is a free software application that monitors and manages network behavior. The Smart SpeedLAN can feature automatic management options that use adaptive networking intelligence to ensure that you are getting the best online experience all time. The Charger Booster is the fastest and most efficient charger solution for Apple devices; users are able to charge their iPAD, iPhone up to 42% faster. Protection+ Features – BIOSTAR wants to make things a bit safer when dealing with sensitive electronic components. As such, the Hi-Fi A88W 3D adapts USB Over current Protection. This is an onboard dedicated power fuse to prevent electrical USB port failure. This ESD protection (Electrostatic Discharge) prevents the USB Port from over-current. In addition, throughout strategic places on the board there are OVER-Current Protection, OVER-Voltage Protection, and OVER-Heat Protection safeguards. These are special circuit designs to detect overvoltage conditions and heat to preventing voltage surges from spreading in real time. Durability+ Features – There are several design features that work towards providing a more durable motherboard on which to build a system. Low RdsOn P-Pak MOS is a low resistance design that can significantly reduce the current in energy loss. It has a low operating temperature, small size, and excellent thermal conductivity. The Hi-Fi A88W 3D also uses a moisture-proof PCB. Computers are often used in humid areas (such as coastal climates). The PCB will oxidize if it can easily absorb moisture. Then ionic migration or CAF (Conductive Anodic Filaments) will be generated. Moisture-proof PCBs meet high density and high reliability requirements for moisture proofing. 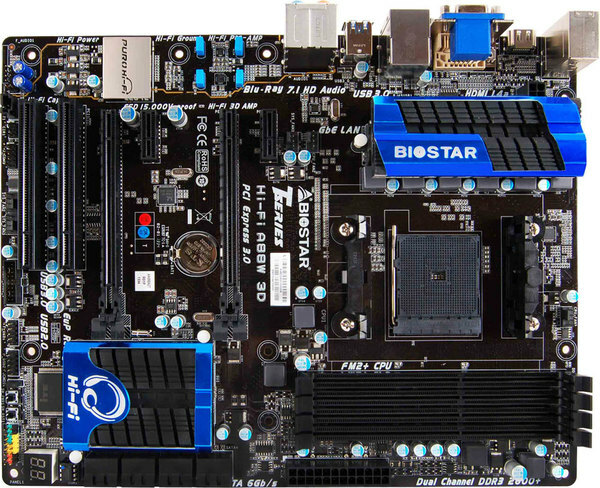 DIY+ Features – For users who love to build his own PC, BIOSTAR fully supports various innovative ways such as UEFI (Unified Extensible Firmware Interface) BIOS interface, a modern and easy-to-use graphical user interface. The UEFI comes with a colorful easy-understand icons leading users directly into the setup layer. BIO-Remote 2 gives users a better Home Theater environment. Users who own either Android or Apple products are able to access and control the PC remotely. This allows a smart device to become an intelligent and functional remote controller. In addition, the BIO-Remote2 feature also includes both the function of a mouse pad and a power point presentation controller.